The lady, who had served as Chairman, National Centre for Women Development Abuja and Commissioner in the Federal Civil Commission, representing Imo and Abia states, at the event, urged women to be politically empowered through focused and active participation in politics. While noting that education is a prerequisite and one of the most powerful keys that will unlock the doors to the upliftment of womanhood, said the need to see the Nigerian woman take her rightful place in contemporary society compelled her to write the book: The Nigerian Woman and the Challenges of the 21st Century: Issues and Prospects. At the book’s unveiling in Owerri, which attracted dignitaries from across all walks of life, including Igwe Nnaemeka Alfred Ugochukwu Achebe, the Obi of Onitsha; Justice Mary Ukaego Peter-Odili; former Deputy Speaker of the House of Representatives and governorship candidate of Peoples Democratic Party in 2019 general elections, Emeka Ihedioha; Chief Emmanuel Iwuanyanwu, Ahaejiagamba of Igboland; Justice Chioma Nwosu Iheme; Henry Nwawuba, member, Federal House of Representatives; Eddy Mbadiwe, former member Federal House; Mrs. Florence Anyanwu, retired Acting Auditor General of the Federation; Dame Julie Onum Nwariaku; former Commissioner, Independent Corrupt Practices Commission (ICPC); Justice B A Njemanze rtd, Chief Judge of Imo State; Olisa Agbakoba (SAN) and wife; Donald De-Nwigwe (SAN) and wife; Mrs. Frances Ikwechegh; Mr Khaleel Bolaji, President of the Alumni of the National Institute (AANI); the author regretted that notwithstanding the potentials of women, there remains a yawning gap and disparity between contributions and achievements of men and women respectively to economic growth, development and other social activities. The traditional Nigerian woman is in a class of her own among the women across the world and had clearly defined roles alongside those of the men, which were mutually complementary, she said.According to her, the colonial experience transcending from Western European masters and to some extent, Islamic cultures, influenced and prejudiced the Nigerian women thus creating an unnecessary divide between their roles and contributions and those of their male counterparts. Colonization brought with it discrimination, marginalisation, socio/economic and educational inequalities. In his opening remarks, Igwe Achebe commended the author for her passion in the civil service, having risen to the apex of her career as the first female Head of Service in lmo State. 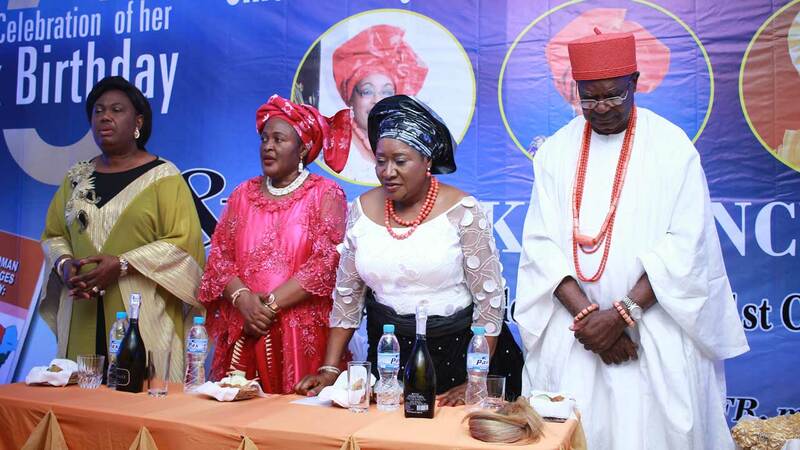 He added that despite the landmarks of her career, Ijeoma was first a wife and mother to her family. He urged women to change their attitude towards themselves positively to the extent that every woman becomes the nurturer of the other women thus creating an enabling environment that facilitates communication, networking and strategising for focused activities and eventual destination to move Nigeria forward for ‘we are stronger together’. Justice Peter-Odili, in her remarks, described the celebrant and author as a woman of inestimable value who exhibited career competence, and is extremely caring, compassionate, committed to putting smiles on people’s faces without seeking reward. In her contribution, Nwariaku, also poured encomiums on the author for drawing attention to the need to focus on strategies to align and re-align female gender issues to ensure the steady growth of equality. According to her, women should be enjoined to remain educationally proactive, advocate and agitate for the actualization of the healthcare needs of the Nigerian woman and invade the political platforms of the various political parties not as dancers or clappers but as active participants in seeking elective office and political appointments. Iwuanyanwu, on his part, re-echoed the sterling qualities of the author drawing attention to her intellectual capacities and noting that she exhibited extreme academic prowess in her days at the University of Nigeria Nsukka. A lot of the guests also made copious positive remarks about the author and her enviable pedigree.